Hilliard residents will continue to have their solid waste, recycling, and yard waste collected on Tuesdays by Local Waste Services for the next five years. The company was the lowest, most responsive bidder for the five-year contract, which takes effect July 1, 2019, and runs through June 30, 2024. The new contract locks in the collection rate at $17.20 per month for the next five years. That reflects a 42-cent per month increase – or about $5.04 more per year – above the current rate. Senior citizens will continue to receive a reduced rate of $15.52 per month. That is just 24 cents more per month, or $2.88 per year, than current rates. The new rates can only increase if fees outside Local Waste Service’s control change. 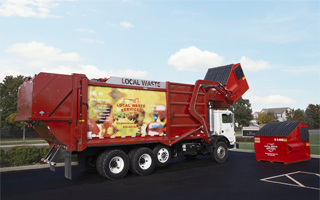 Such fees include material processing costs, regulatory fees, and the cost of the compressed natural gas that operates Local Waste’s vehicles. Billing will continue to occur semiannually, but residents can benefit from a 10 percent discount if they pay for their full-year of service in one payment. Residents will see the same service level they have enjoyed in the past, including Tuesday collection of all materials, the same collection bins, bulk pickup, and the option of back door collection for an additional fee.